Right at this very address used to be one of my favourite Italian restaurants. It’s replacement, Earth’s Kitchen, just made things a whole lot healthier. 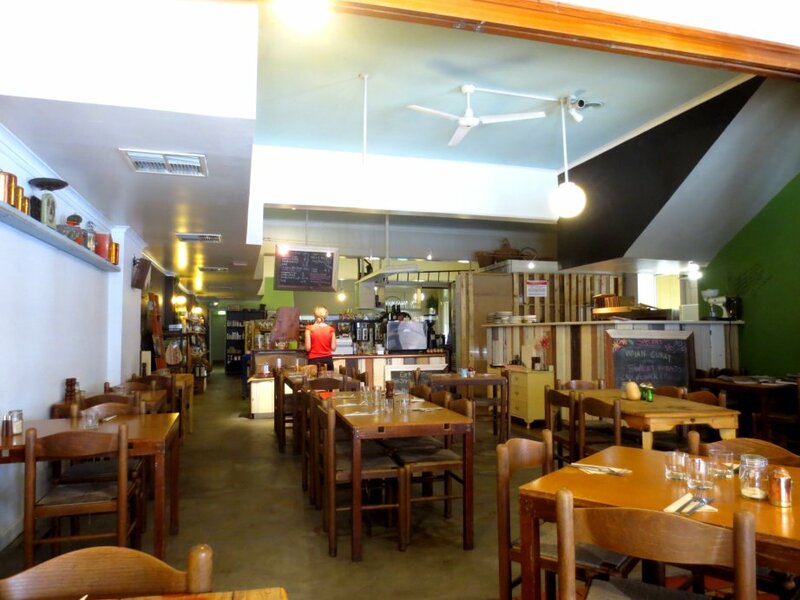 Located on the corner of Pirie and Hyde Street, this place prides itself on everything fresh, local, organic and gluten free. The menu isn’t too overly complicated with a selection of entrees, salads and pizzas to choose from. The place is not strictly vegetarian as I saw a choice of two meat pizzas on the menu. I also saw gluten free sweets behind their counter if you feel like something a bit extra. The decor is fairly basic with a rustic feel. The timber furnishings and panelling give this place a cosy vibe, and the abundance of natural light coming from this corner building makes everything all bright and airy. 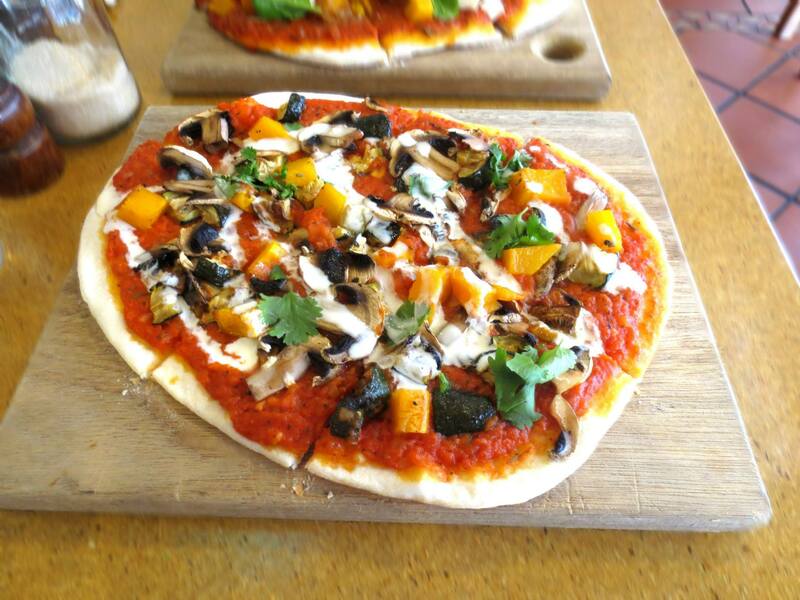 Today, I ordered the Spiced Vegetable Pizza. The meals arrived 15 minutes after ordering and were nicely presented on wooden chopping boards. The definition of “spiced” on this pizza refers to North African spices which to my knowledge is a mixture of cumin, garlic powder, sugar, cinnamon, allspice, paprika, salt, black pepper, cayenne pepper and turmeric. I personally thought too much pepper was added and it overpowered the taste of the pizza. The roasted pumpkin was soft and delicate, while the mushrooms were nice and firm. The tomato base was fresh and there was a hint of tartiness from the preserved lemon yoghurt. The base was thin and consistent through out. While there were remnants of oil marks on the chopping board, the pizza wasn’t too oily and I didn’t feel bloated after eating it. I swapped a pizza slice with my friend so that I could see what the Pumpkin Pizza was like. This actually tasted better than the pizza that I had. 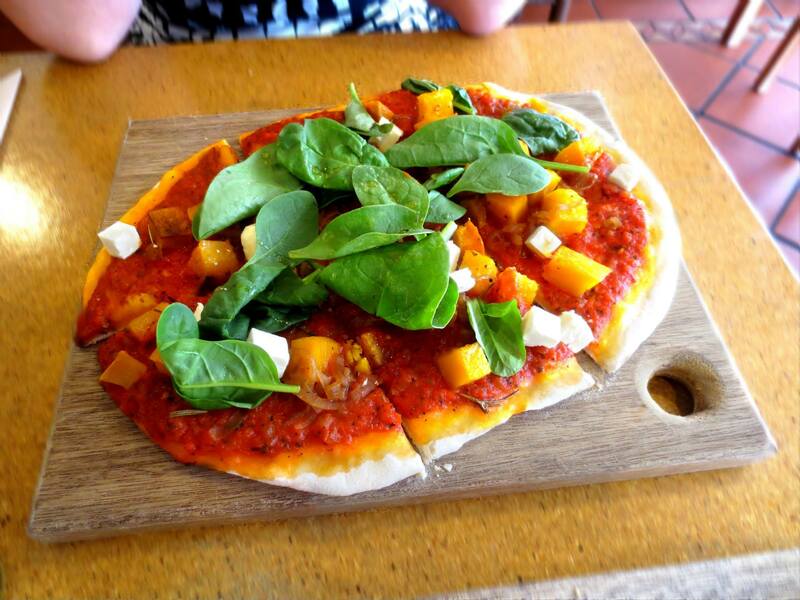 The roasted pumpkin, feta, caramelised onion and spinach all worked in harmony to create a delicious pizza. Sometimes the simpler the toppings, the better the result, and this rang true with this pizza. The staff were friendly and the service was above average. The atmosphere was relaxed, even with the busy lunch time crowd. The pricing is a bit higher than what I expected, but then again, anything that’s organic or gluten free is usually more expensive. It’s not a bad place to come for your healthy meal options.